Meet one of the biggest monkeys on the planet. 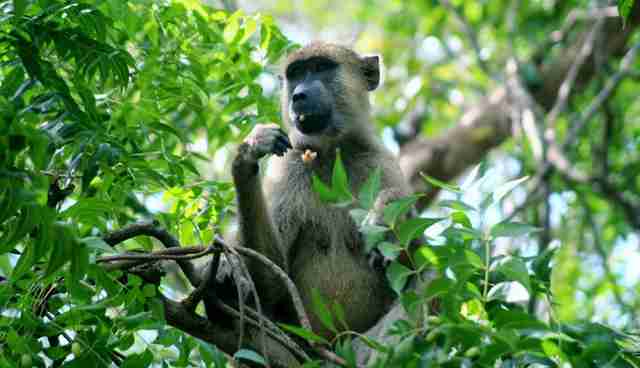 Often wrongly confused as an ape due to their size you will usually hear, or perhaps smell the yellow baboon (Papio cynocephalus) before seeing them; called Nyani in Swahili. They are an impressive sight and are viewed here by locals as pests; often hurling rocks at them when they come on their land. Even ex-pats will have large dogs and slingshots with small rocks at the ready in case. 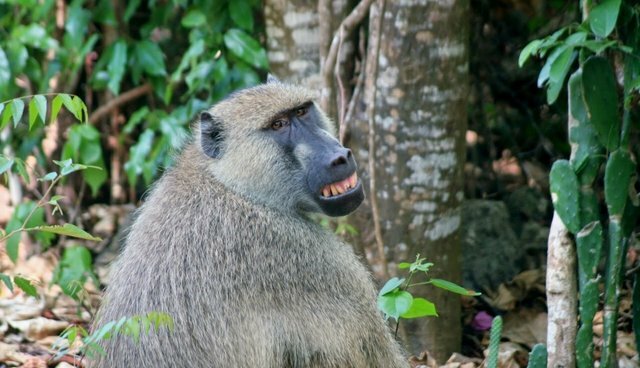 At a weight of anything from 20-55kg (the Diani baboons are considerably large) and head-body length 70cm, 50cm standing at the shoulder, an adult male yellow baboon is quite a powerful creature. The males are around twice the size and weight of the females. They have yellow-brown hair, barrel chest, a prominent muzzle, large cheek pouches and close-set, amber coloured eyes. Their back legs are shorter than their front arms and they walk on their fingers and the soles of their feet. It takes males 7-8 years and females 5 to reach sexual maturity. 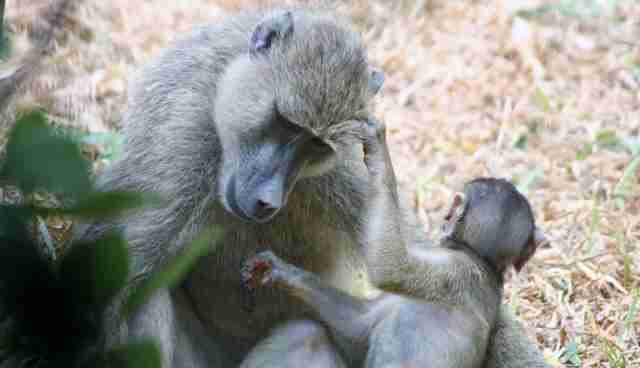 Yellow baboon infants are actually born black with pink faces, hands and ears; usually around six months these will turn brown. Both males and females have "ischial" callosites which are large sitting pads, the females are spilt and the males joined. Females have very pronounced sexual swellings between the sitting pads, this signifies when the female is ready for mating. 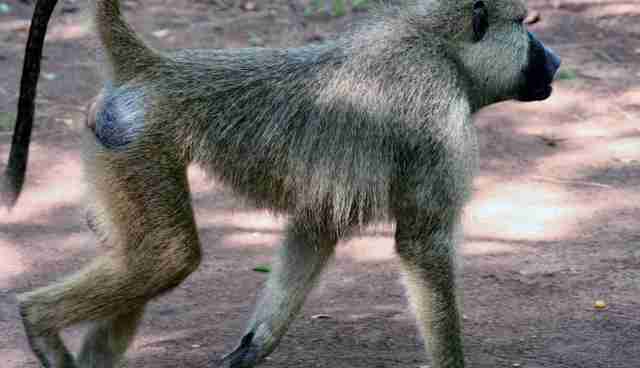 Distribution: Mainly a terrestrial, coastal baboon their primary habitat is the savannah, but due to their amazing ability to adapt they can survive almost anywhere. Although they are not threatened their numbers have been declining in Africa overall in recent years due to eradication programmes. Diet: Naturally yellow baboons eat roots, bulbs, grasses, herbs, flowers, buds, fruits and leaves as well as catching insects and are know to prey on rodents, rabbits, birds and monkeys. They will eat human food and are notorious crop and garbage raiders. 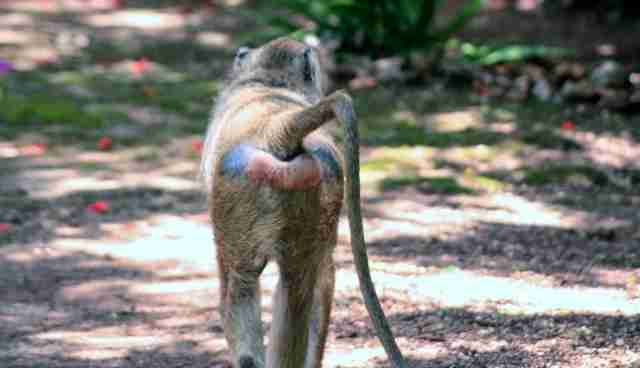 Feeding baboons would be a very bad idea. 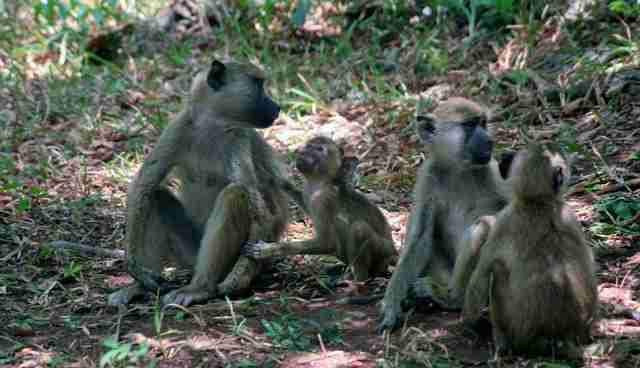 Social Structure: The baboon's social society is complex and made up of multi-male multi-females troops, ranging in size from 10 to an impressive 200 individuals. Their range size can vary greatly as well depending on habitat, heavily wooded areas could be 2km squared and perhaps 30km squared in more open areas. 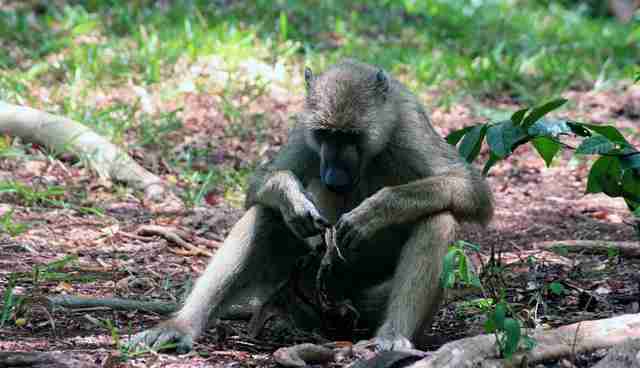 As I touched on at the start of this post, baboons are very noisy, rowdy animals making boisterous displays daily at dawn and dusk. The males often also get into noisy, and if you are accidentally too close, scary scraps. 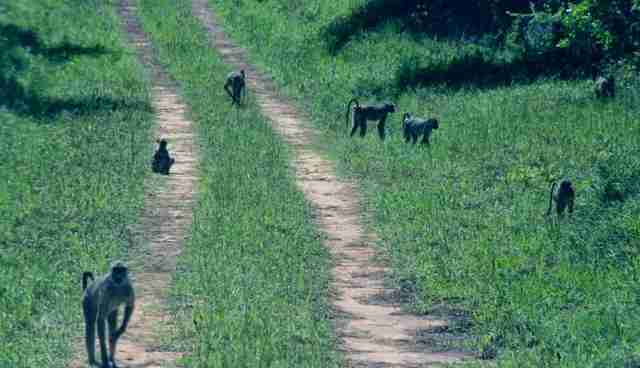 Monkeys as pests: With the exception of the colobus the other monkeys in Diani, are opportunistic feeders, taking what food they can when they can, and so will raid crops or steal food from kitchens in homes or hotels. Some local residents have appalling methods to deter these individuals: from throwing paint over them to stoning them or using bows and arrows. 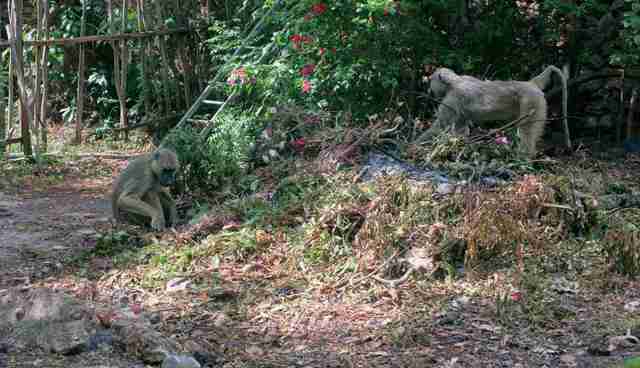 This human-wildlife conflict is made worse when well meaning individuals giving monkeys food – as the monkeys come to associate humans with food. 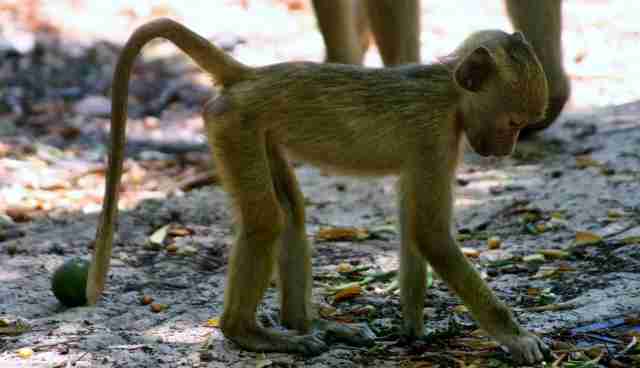 Men can generally rebuff monkeys who may approach them, but women and children are at risk of being bitten when they refuse to give monkeys food. To combat this, CC has developed a detailed guide on managing the pest problem and provides workshops and training sessions for hotels and private houses. We also hope that you can help us by explaining to others why monkeys must not be fed. As always the pictures are owned by the author and under their copyright. "The views and opinions expressed in thpost are purely my own and are not in any way linked to any organisations I may represent or work with unless otherwise stated. All photos are my own unless otherwise stated and a source will be provided where other photos are used; if they are yours and you would like them taken down then please just ask. The author retains full copyright for all content and photos and written permission is required before their use. The author of the site is not liable for any content accessed through links posted."